**The Hot Shop in the Whiteaker neighborhood of Eugene is now closed. We are in the process of relocating our studio. We are still taking custom orders, please reach us by phone or email. View our installations at the Kona Grill restaurants in Eden Prairie, MN, Tampa, FL, Woodbridge, NJ, North Phoenix, AZ, and Richmond, VA.
We specialize in designing and creating custom hand blown art glass wall or ceiling installations, chandeliers and other lighting fixtures using hand blown glass and fine crafted metals. We work with designers, architects and individual clients to create unique beautiful, bold pieces of art work for commercial and residential spaces. We work with our clients to come up with a collaborative design that will work with the space, colors and form. We can also create custom art glass for existing lighting pieces. All of our work is hand crafted and of the highest quality. Our lighting pieces are safety inspected and comply with UL 153 and UL 1598 upon request. 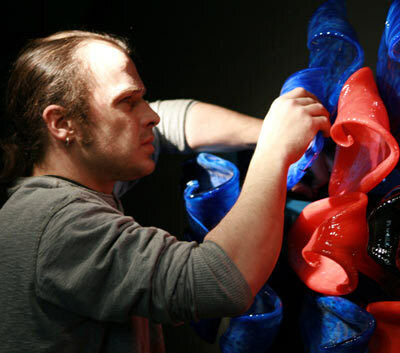 Samuel Decker is the designer/glass artist behind all of our work. Samuel's work style is bold, elegant and fluid. He loves to use color and loves a challenge of a new complicated piece. Many of his art pieces contain many small pieces of glass arranged together to create larger mosaic pictures. He is also known for his large multi piece tropical flowers. Other Support: Jess Ordower, Eugene Glass School, Luvisi, the Chihuly hot shop team and all the other Seattle glass blowers. All of our glass work is hand made art, therefore no 2 pieces are exactly the same. All glass pieces are subject to variances in size, shape and color.